Since the price hike on February 25, Bitcoin Cash [BCH] tried to navigate a bear market but has been unable to recover its recent losses. The coin has not been able to cross the $140 dollar mark and was trading at $132.23, at press time. At press time, the cryptocurrency experienced a fall of 0.89% over the past 24 hours. The coin’s market capitalization was recorded at $2.3 billion with a 24-hour trading volume of $275 million. The coin was traded majorly in the P2PB2B exchange where it contributed 9.86% of the market capitalization, worth $28.5 million. The leading trading pairs were BCH/BTC and BCH/USD. 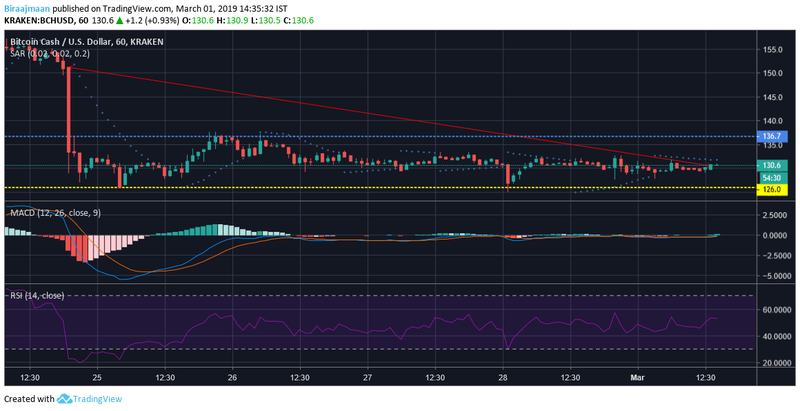 The one-hour chart shows that the BCH market had not recovered from the losses it suffered on February 24. The downtrend for the coin extended from $151.30 to $130.80. The resistance level held at $136.70 while the support line held steady at $126. The Parabolic SAR was hovering over the candlesticks and flattening above, indicating a continuing bearish trend for BCH. The MACD line indicated an uncertain trend as the MACD line and signal lines were very close to each other. The Relative Strength Index indicated a neutral trend as the marker was between the 40-line and 60-line. This suggested that both the buying and selling pressures evened each other out. The one day chart showed a massive downtrend that extended from $627.5 to $153.7. The Bollinger Bands projected a neutral trend for the next few days as the marker is indicating neither a bullish nor a bearish trend. The Chaikin Money Flow line indicated a low cash-inflow for the BCH market as the line was below the zero mark. The Aroon indicator projected a bearish trend for the coin. 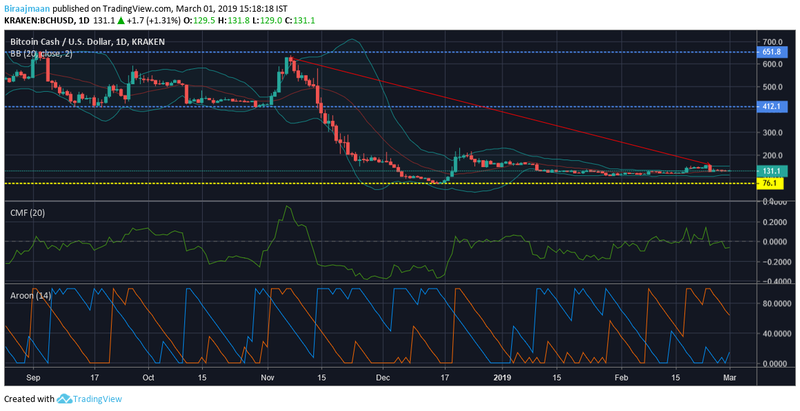 All the indicators projected an overwhelmingly bearish trend for BCH as it tried to navigate the bear market.